Gallery: You can design your own tags with a simple editor. You can't share them, though. Also: unlockable songs! Even if Sega had screwed up this HD reworking fairly radically (Sega hasn't, I'm glad to say) it would still be one of the most striking games you could play on a 360, or a PS3, or a PC or any of those other platforms it's going to be hitting fairly soon. It's both a wonderful gateway back to a very specific moment in history - it's got a hint of the Battle of Seattle to the whole thing, while the second chapter, I now realise, is rather heavily influenced by The Matrix - and a timeless art design lesson in how to make a game, well, timeless. Jet Set Radioooooooooo! Let's cover the basics, then. Sega's latest is a gussied-up version of the original Dreamcast classic. It plays in native widescreen, its textures are all sharp edges and HD resolutions, and the camera system has been adapted for two sticks, with viewpoint on the right and movement on the left. There are leaderboards and some new graffiti designs sourced from the community, and there's a lovely 10-minute documentary that interviews key players from the game's creation while offering you a vital sense that Sega sometimes cares a little more than the average bear about this business of re-releasing old titles. The frame-rate is excellent throughout, and the audio combines the Japanese, European and North American soundtracks with - I think - only two missing songs. (These are Yappie Feet and Many Styles, I gather.) It's a lovely, carefully put together package, all told - and when it hits the Vita in a few weeks, it's probably going to be even better, due to touch-screen graffiti controls and that lovely gaze-filling OLED screen. This is worth restating: Jet Set Radio looks so much better than most HD remasters, and that's because its famous cel-shaded art style means that there aren't a lot of ropey, out-of-date textures in place to whither shamefully beneath the penetrating stare of a modern TV. The skybox can look a bit speckly on occasions and some of the horizon work seems a touch naff in 2012, but most of the game is still pure colour and sweet animation and breathless forward momentum - and that stuff doesn't really get old. Elsewhere, the audio in Professor K's cut-scenes is rather crackly - though when Combo takes over, weirdly enough, it's fine - but that accounts for perhaps two minutes of the game's running time. It's a shame, but it's a very low-level shame, like having an uncle in a category C prison. Stepping away from the aesthetics - which is a crucial part of the appeal for a game like Jet Set Radio - the controls feel slightly creaky by modern standards. It's hard to manoeuvre when leaving half-pipes and things get really awkward when you're trying to make precision jumps at relatively low speeds. That last part is probably part of the design, mind, and none of the rough edges should hold you back from skating glory. The only major annoyance is that the left trigger still covers camera-centring duties along with spray-painting, which means it's easy to get yourself turned around during certain high-drama sequences, such as the pursuit of the Poison Jam gang through the sewers of Tokyo-To. Talking of the pursuit of Poison Jam, I was - pleasantly - taken aback by how challenging Jet Set Radio is. I've spent most of the intervening years since its release playing Jet Set Radio Future, and the sequel not only takes out the thumbstick twiddling you need to lay down tags, it removes each level's time-limit. Gallery: Combo's a bit of a plank to move around, but I love his commitment to holding that stereo. These two elements make it a fundamentally different proposition. Jet Set Radio Future's largely about acting cool in huge, complex environments. 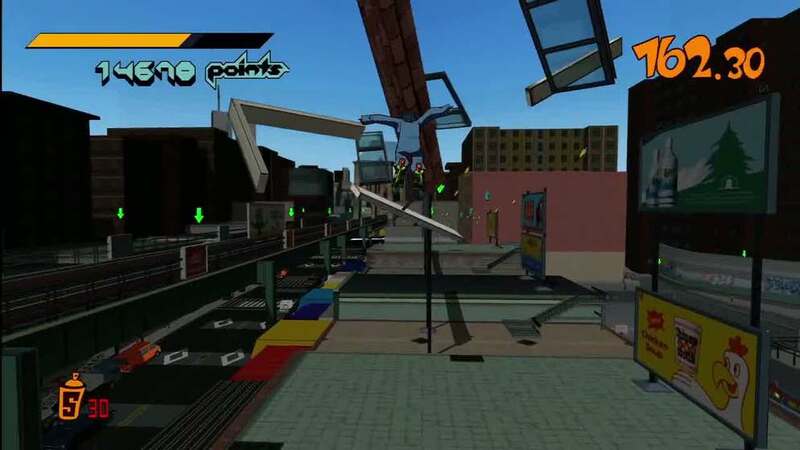 The original Jet Set Radio is a spatial management game at times: you look at the clock, spot the placements of paint and the really big graffiti spots, and then work out the optimal route through the environment, hoping to get the hardest stuff done before your enemies really ramp up their attacks. It means that even the simplest stages have a nail-biting feel to them as you miss the correct exit or get ploughed down by a subway train, while levels like the Kogane Construction Zone are essentially huge clockwork puzzles, in which you prioritise the massive exposed target in the middle of the map, say, and try to get it taken care of before the attack choppers arrive. It also ensures that you have to really work in order to act cool here. You have to earn it. Everywhere you look, meanwhile, you're drawn into a world that's gloriously quirky and exciting. I love the fact that Gum waltzes into action wearing some kind of football helmet, that the cops sent in on your tail pump their arms vigorously in time to the music, and that the distant skyline in Benten, the luminous city of the night, glows a deep, mysterious green. I love the fact that characters pull off different dance moves when left to idle, and that the military hardware that's increasingly pitted against you has more than a hint of the Advance Wars series to it. Along with Intelligent Systems' turn-based marvel, Jet Set Radio has some of the best troopers and the best helicopter gunships in gaming, if you ask me. When you're avoiding their cannon-fire outside shops with names like Burger Queen - and when the next level promises to throw you in with electrical ninjas or whip-wielding assassins - it can be hard not to embrace the simple life in Tokyo-To wholeheartedly. 12 years on and this is a surprisingly rigorous game built of oddball delights, then, and the HD updating has only enhanced its charms. The skating's still great, the city's still a joy to explore, and the soundtrack's still one of the very best ever put together. In other words, Jet Set Radio's still capable of making people say, "What the hell is that?" Or rather, "What the heck is that?" Sorry, Will.